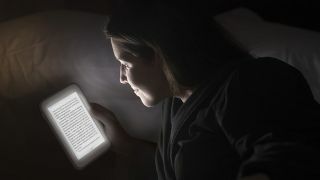 The Amazon Kindle Paperwhite is arguably the king of the ereader world, but Barnes & Noble is not backing down without a fight and the US book giant has just released a new competitor in the UK, the Nook Glowlight. In terms of the name things have been streamlined from the Nook Simple Touch Glowlight, which launched almost two years ago, with the clunky middle suffixes being dropped for a cleaner approach. The new-look Nook Glowlight has actually been available in the States for a while now, so it arrives in the UK without the benefit of the very latest technical advances. That said it's still an enticing proposition at just £89, making it £20 cheaper than its Amazon rival while boasting a 15% brighter backlight that the Paperwhite. The screen also boasts sharper text over its predecessor with 62% more pixels shoved into the 6.5-inch display, and the E Ink technology has been given a boost by Barnes & Noble with the elimination of full page flashing, making for smoother page turns. It's slightly heavier than the light-up Kindle at 175g (vs 170g), but that shouldn't be an issue, and it has enough storage for 2000 texts - again one-upping the Amazon option which can hold just 1,400. The Nook Shop has also been improved, offering over 3 million books, magazines and newspapers, a range of new content and personalised recommendations. Battery life should be good for around two months, depending on how liberally you use the backlight, and you can pick up a Nook Glowlight from today from a number of retailers including Argos, John Lewis and Sainsbury's.